The Canary Islands are located off the coast of Morocco and are made up of 7 bigger islands and 6 smaller islands which are famous for surfing in the Canary Islands. They stretch for 450kms and cover a surface area of 7 500km². The Canaries are a part of Spain due to historic and political reasons however they have a more similar geographical lay out to Morocco. The region has been shaped by volcanic archipelagos that group together the Azores, Madeira and the Cape Verdi Islands. The volcanic landscape is very distinctive with a diversity of hills and mountains. The islands themselves are made of lava and basalt and the land is very fertile particularly after the rain which is becoming more and more infrequent. The coastline is blessed with vast sandy beaches full of reefs, points and deep bays. However in some areas there are many cliffs and steep rock faces similar to those found on the western and northern coasts of Gran Canarias. This place is an excellent compromise between the predictabilities of a trip close to home (in Europe) at a low cost and the guaranty of good quality waves. These islands are located in the middle of the Atlantic and are swept by the trade winds and exposed to cold ocean currents that surround the coastline. The annual average temperature is 20 °C (with small fluctuations) except in the mountains where it’s lower. In summer temperatures rarely exceed 30 °C. Sometimes a hot wind blows from the desert and along with the 300 days plus of sunshine per year, the climate of the Canaries is considered one of the most pleasant in the world. Lanzarote is nicknamed the Hawaii of the Atlantic, due to its exposure in the middle of the ocean, its topography, lava seabed and good north / northwest swells brought about by the north Atlantic weather systems. From October to April waves of 1m to 5m break onto the best exposed reefs. Tropical Storms from the south of the USA send some nice waves from the west during August and September too. 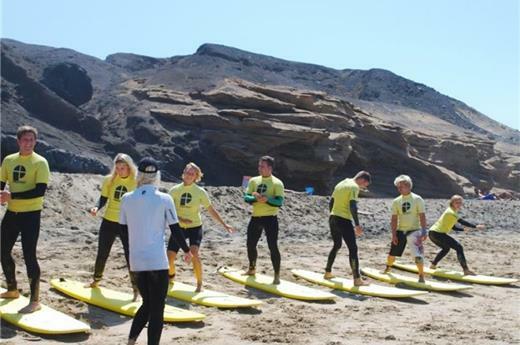 Lanzarote has the best quality waves in the Canary Islands, perfect for surf holidays. The waves are gnarly and powerful like on the North Shore of Hawaii but it’s much closer to home! !